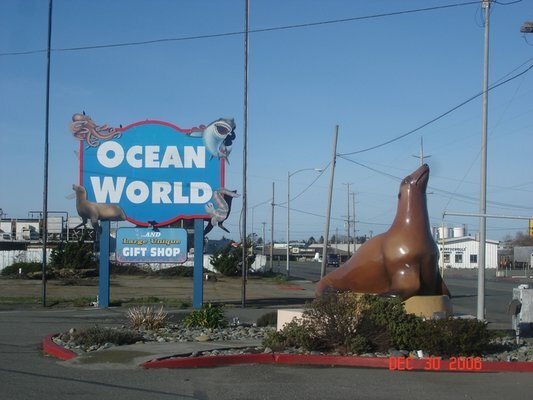 You'll take a guided tour at Ocean World, that's the only way they do it. But actually you really do get more out of it that way. These are interactive tours where trained staff teach you about the life from the ocean in an educational and entertaining way. Tours take about 40 to 45 minutes and they're not on a specific schedule so you usually don't have to wait more than 20 minutes. You'll be able to pet a shark, see and learn about sea life and cute areas where you can take a picture with a pirate, in a sharks mouth or on a surfboard. The Touch and Feel Tidepool Exhibit is the kids favorite. You'll learn about sea slugs, sea stars, nudibranchs, sea anemones and more. This is both fun and educational! This aquarium looks a little on the small side but once you get in to it, it's like a mini zoo for sea life! Its fun and the sea lion show was a hit. They are so cute! Its not every day you get to pet a sea lion or a shark. Open seven days a week except for Christmas. The aquarium is lit by natural sunlight so all tours end at dusk. Kids 12 years old to adult costs $9.95. I have not personally stayed at any of these hotels so please click on each one to read the reviews before booking your trip.